The Rice Lake 150-10-5 digital physician scale is designed for both modern appearance and contemporary function, with fresh, clean lines and forward-thinking features for the medical and fitness environments of today and tomorrow. The Rice Lake 150-10-5 digital physician scale prepares you for the future requirements of electronic medical record keeping by letting you easily transmit scale data to external devices. The feature-rich 150-10-5 digital physician scale is an incredible value, with premium precision and accuracy in a heavy-duty design. 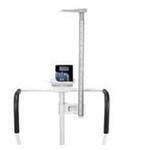 An integrated height rod tucks neatly within the scale column, and the large, stable scale base is both comfortable and easily transported by two integrated rubber wheels. Whether powered from an AC adaptor or standard alkaline batteries, this model is easy to use. 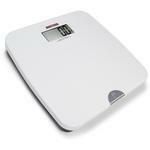 Its large push-button display lights up for easy viewing and an audible beep sounds at the end of each weigh cycle. 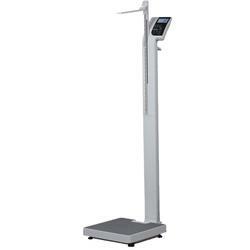 Add to that a 550 pound capacity and exclusive Motiontrap movement compensation technology, and this Rice Lake model is one of the most accommodating physician scales on the market.